Last weekend when I started my computer and Norton 360 Premier Live Update, the following error message appeared. I pressed OK a few times and then the error message disappeared. 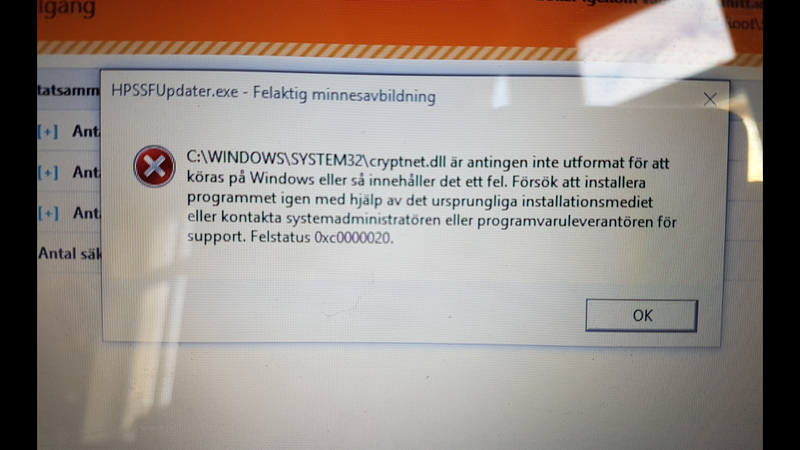 C:\windows\system32\cryptnet.dll is either not designed to run on Windows or it contains an error. Try installing the program again using the original installation media or contact your system administrator or the software vendor for support. I have not used my computer all week and when I start my computer today and run Live Update, the same message appears repeatedly. I restart the computer and the message disappears. I have updated Norton Premier 360 and also made a full scan and Norton finds nothing strange. But the file name, cryptnet.dll, does not feel good. I find that the message comes when I start the computer and then starts live update. What is it? Do I have to worry? What can I do? Here is a site you can use to get information. Please do not use the tests of files listed on the site. This is for information. As this is a Windows system file that may be corrupted, you can check your Windows installation with the instructions below. In addition to the advice already, if you have a bootable Windows CD or FD, you can use that to repair any files that might have gotten corrupted. You may also want to figure out how this file got corrupted (not 100% sure that's the cause). You could have a failing hard drive, bad ram, or simple filesystem corruption. Either way you probably want to determine if it was a fluke or just the first problem that was noticeable.